All of the courses on the main Scenehouse programme are hosted in Edinburgh. Scotland’s capital city is generally regarded as one of the most beautiful in Europe. Both its medieval Old Town and its GeorgianNew Town are listed together as a UNESCO World Heritage Site. It has all of the activity and facilities of a European capital but with less than half a million residents feels a lot more relaxed than hectic London or even its near neighbour Glasgow. 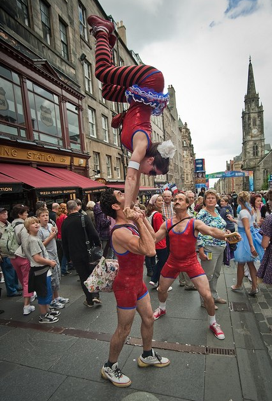 The very name Edinburgh is synonymous with performing arts and festivals. In fact the city hosts twelve major festivals over the course of each year, and you can find a guide to them all here. The biggest and most famous is the Edinburgh Festival Fringe, the largest arts festival in the world. This year there will be more than 2,000 shows across 250 venues, totalling a staggering 32,000 performances. Public transport in Edinburgh is excellent. The main provider is Lothian buses. Passengers can pay per trip (buses do not give change) or purchase a four week travel card which costs £48 from Lothian buses offices. The city centre is very compact and best explored on foot. Scotland is often perceived by overseas visitors as a land of snow and rain, but for a city that lies on the same latitude as Moscow the weather is very mild. In July the normal daytime temperature range is 10 - 19 Celsius / 51 - 66 Fahrenheit, and the days are very long. It’s still light enough to go for a walk at 9.30 pm. Whilst Glasgow sees more rainfall, Edinburgh can be windy. Bring a kite. We have scheduled the last Scenehouse course to end on the Friday that the Fringe begins so that those of you keen to experience Edinburgh en fest can move straight from one to the other. Be warned, accommodation prices rise steeply and you’ll need to book early. Edinburgh has no less than four universities, a prestigious art school and many other colleges. One fifth of the city’s population are students. As a result Edinburgh is a fabulous city in which to study, providing many student orientated services. For an overview of the mass of cultural activity happening in Edinburgh and Glasgow before the Festival Fringe check out The List and The Skinny.